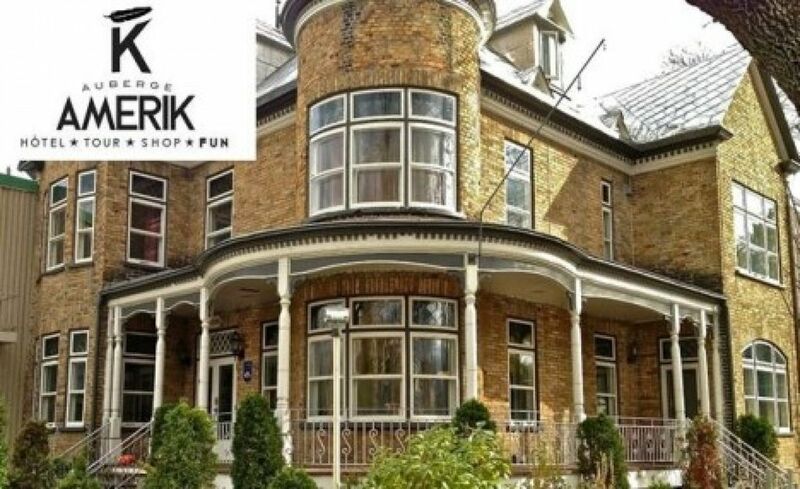 Auberge Amerik is situated 5min drive (25 min walking) from the Old Quebec city center - and there is so much more to see! We offer you a complete holiday package for your individual discovery of beautiful Quebec City and its region at your own rhythm - With an extraordinary reception, authentic experiences and exclusive ideas! Combine your stay at our hotel with a wide range of activities, offered at our reception desk, to come in touch with the real Quebec - active, tasty and surprising! Forget about long research on the web, just ask for our (self experienced) recommendations. In only 15min, we will design you unforgettable holidays of 4 days or more, including numerous advantages at our partners' ( all small, local, dynamic businesses like restaurants, shops and touristic sites) !!! Our services include restaurant with terrace for breakfast or supper, bike rental, access to fitness room, NeuroSpa and massage. Wifi and parking FOR FREE. Our hotel is 100% smoking free. We accept animals. You can choose from 8 charming rooms with Queen or double size beds, kettle and tea, shampoo and hairdryer, with access to fridge and microwave. Our marvellous Victorian style building is situated 5min from Quebec City center, in a trendy, artistic neighborhood. We offer PARKING FOR FREE. Within 10min you'll find the impressive Montmorency Falls, the fertile Isle d Orleans, the Native reserve Wendake and the Bay of Beauport, Quebec City's most popular beach, as well as other major attractions. At the crossroads of 4 bicycle paths of all levels, Auberge Amerik is THE departure point for your active discovery! Children under 12 years stay for free in their parents' room. Please note that we might suggest you different rates in case of holidays or local festivities. Wonderful stay in Quebec City! We loved our time at the Auberge Amerik, and would definitely stay again! The staff were so friendly and helpful! Loved the restaurant, too. The room was clean, updated, and quiet. Staff helped us with the details to take the bus, so we didn't have to drive. There are nearby restaurants. Loved it, and so will you! We appreciated the central location of the Auberge Amerik with easy access to Greater Quebec. Parking was not an issue, at the site or across the street as well as public bus stop nearby. A nice feature was the laundry on the second floor for guests. Our third floor gabled attic room was comfortable for the most part. Angled walls were a challenge so as not to hit your head as well as the double bed was a tad short for a 6' person. There was no TV in the room or lobby area. As well, the restaurant closed early. So, there was little to do on site. Overall, it was a comfortable two-night stay at a very affordable rate. We enjoyed our stay very much. All the people were very nice and accommodating. We were not too happy with our 1st room and they gladly moved us the next day. Not all rooms had TV so we asked for one and got one on our last night there. It was a pleasure having a cafe and spa on premises. I would stay there again but I would request a room on the 2nd floor. I didn't like climbing the stairs to the 3rd floor when coming in after a day of sightseeing.. I recommend this place highly. It was well maintained and very clean. My wife and I had the opportunity to stay at this hotel for a week in December. We were very pleased! Nice hotel. Very responsive and polite staff. The hotel is kept neat at all times and is located within minutes from several places of interests, including but not limited to Old Quebec, the Montmorency Falls, several museums, ski lifts, and dog sledding. The caretakers (Stephanie, Francois and Nicola- they're bilingual by the way), take joy in making sure you enjoy your time in Quebec no matter your length of stay. They are very knowledgeable about the area and will sit you down and map out sites of interests on your first day. We stayed in the yellow room, which was quite roomy. There was a fridge and microwave just outside our room which was convenient for times we chose to eat in. We'll definitely be using this hotel again if ever we're in the area! Netter Empfang und gute Information über Quebec! Wir wurden herzlich empfangen und informativ beraten was man in Quebec und Umgebung anschauen sollten. Unser Zimmer war klein mit eigenen Bad aber ausreichend für 3 Nächte. Parkplätze waren auch vorhanden. Es ist immer etwas außergewöhnlich in so alten Villen zu übernachten. Die Treppen und Holzdielen krachen unter den Füßen. Es hat einen bestimmten Flair dort zu übernachten. Bushaltestelle 5 Min. vom Haus entfernt. Gegenüber der Bushaltestelle kann man in einen kleinen Laden Tagestickets kaufen. Die Fahrt nach Quebeccity dauert nur ca. 15 Minuten. Wir waren rundum zufrieden! Children under 12 years stay for free in their parents' room. Please note that we might suggest you different rates in case of holidays or local festivities. Extra person fee of 25 per person per night after the first 2 guests.